We all know that manual facial brushes aren't anything new, far from it - I think I bought one as a teen a few years back from The Body Shop? With the fairly recent arrival of electronic facial cleansing devices such as the Clarisonic et al, I have noticed the prices slowly creep up - less than ideal if you are not sure the process is suited to your needs or skin type. Well perhaps the answer you have been looking for is the new Origins Mini Facial Brush which will cost a mere £5 - kudos to Origins for not only seeing the gap in the market for such tool but also making it so affordable. The Origins Facial Brush is a hand held brush that is fairly small in size which is not at all a criticism. I rather like that it is both dinky and soft, the size means I can easily target the areas I want to gently exfoliate and the soft bristles do not further irritate my acne/inflamed skin. If you find facial scrubs to be irritating and/or don't want to splash out on an expensive electric facial brush, this is what you have been waiting for. Used with your normal cleanser this gently removes any dead and dry skin cells gently revealing brighter skin and if you ask me almost offers up a spa like experience. As the bristles are so soft and flexible for that matter, I'd say it is almost impossible to over do it - great if you are heavy handed like myself! It also cleans up beautifully which is not something I can say for all cleansing brushes. I also like that it has a nifty cap to keep the bristles clean when not in use and to keep it safe when travelling. 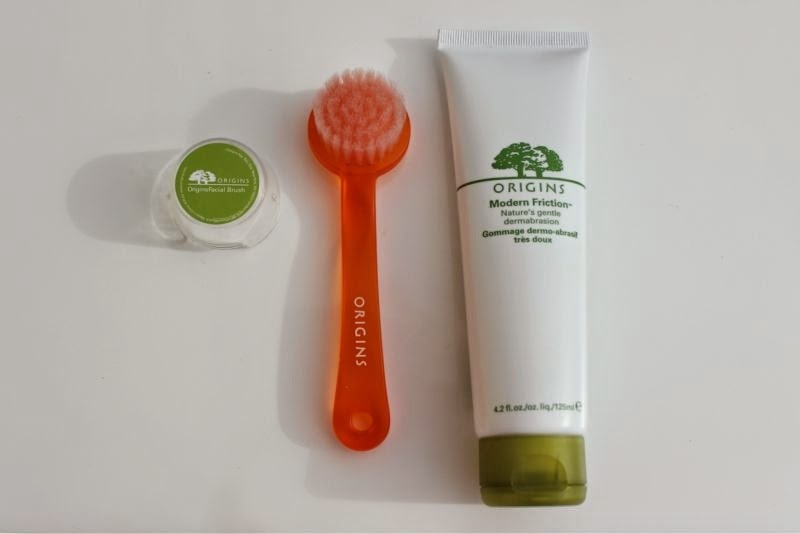 Typically I use the Origins Mini Facial Brush once a week - anything more is a little overwhelming for my skin type. A weekly treatment allows me to gently but deeply cleanse my skin and has not resulted in a purge or any type of irritation what so ever.At just £5 you owe it to yourself to give this a whirl when it launches on the 1st of May, if it turns out you don't like it for facial use you could also use it to scrub your feet and/or nails. This sounds so great, most of the face brushes I try are super harsh on my skin! I was wondering if you could do a review on Kiko foundations, name the Liquid Skin & Universal Fit ranges. Since we have the same coloring (Mac Nc 35, and I also wear Illamasqua SB foundation in 10 & Nars Ginger concealer), I'd be interested about the Kiko shade matches as well as quality since there's no Kiko store where I live. Much appreciated :). Oh, I do love a good tool. This brush looks lovely. I'll certainly be keeping an eye out for it. This sounds great, I used to use the Sephora brush and it was so harsh!